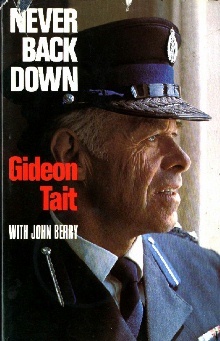 Gideon Tait was the Assistant Commissioner of Police from mid 1974 to the end of 1975. He was very effective in this role, and gave the gangs amongst others a good hammering. Unfortunately those who followed were constrained from taking such a hard line. Sure, he was not flawless, and some of his ideas seem dated today, but others, such as the Task Force are still relevant and useful today. This excerpt is from his book "Never Back Down" published in 1978. Barring some of the now rather quaint terminology (e.g. bikies rather than gang members), it could have been written last week - but it describes the situation as he saw it in the early 70's. Amazing how little progress we have made with this problem in the last 25 years. There was a cheer from the audience which echoed round New Zealand when Norman Kirk, as leader of the Labour Party in the 1972 election campaign, promised to get tough with bikies. He would confiscate their bikes, he said, and prevent trouble before it got started. No wonder those words struck a responsive chord with the electors. Most New Zealanders- family people with a sense of decency and a respect for others - were repulsed by by the behaviour of the motorbike gangs. They wanted to enjoy a blossom festival, a holiday at a motor camp, a cool beer in a pub or a Sunday drive with the children without the annoyance or even the menace of the loutish motor-cycle marauders. Because of the incredibly back-pedalling stance of headquarters in Wellington, the police had been unable to control them. Who could be surprised that the bikies were cocky and arrogant? Now at last, here was a man who promised action. That statement, repeated many times before polling day, must have won the Labour Party a lot of votes. I was dumbfounded when, only a month later, I discovered that the promise was hollow. I was speaking with the Prime Minister at the opening of the new Christchurch Police Station in December when - almost casually - Kirk told me that he did not know how he could assist the police in dealing with the bikies. "I'm meeting a lot of opposition from some of my own people, especially in Cabinet", he said, "It is not as easy as I thought." I got the impression that, having run into opposition in the Labour Caucus, he decided the issue was no longer worth the bother. I found it difficult, that day, not to reveal my disappointment and annoyance. Kirk at the time seemed preoccupied, as if he had a lot more on his mind than police and bikies. It made me wonder whether his promises were as meaningful as many similar ones made by other politicians in the weeks preceding an election. "The situation with the bikies was becoming desperate." The situation with the bikies was becoming desperate. After police action against bikie goons at Alexandra, Commissioner Sharp had ordered a big inquiry into complaints by gang leaders of police violence. The police were castigated as a result and some senior policemen were disciplined and fined. It was a shattering blow to police morale and a shot in the arm for the bikies. The Commissioner seemed almost to be encouraging criticism of his men. Certainly he paid undue heed, in my view, to complaints. The result was back-pedalling by the police all over New Zealand. It was shocking. Motorbike gangs were openly flouting the law and threatening innocent people. Yet they were given flippant treatment by the courts on those occasions when it was possible to act. The bikies roared around virtually with impunity and traffic officers were scared to do anything when they breached regulations. In fact the officers were asking for police protection. I never cease to be bewildered by those so-called liberals who will look for excuses when a lout is guilty of violence and yet will be quick to cry "Fascism" if a policeman finds it necessary to resort to violent measures to defend himself or to deal with a violent situation. Certainly I have always trained my men that they must never use stronger measures than are absolutely necessary in a particular circumstance. That is the law. But how do you deal gently with "animals" who have no respect for life or property or for the dignity of others, and who use bicycle chains, knives and broken bottles as weapons? Do those same liberals ever give a thought to the safety of a policeman, who is just a man with a wife and family at home? There was the incident at Domett in North Canterbury. a woman was having her car filled at a petrol station when a gang of twenty-four motor cyclists arrived. She and the service station attendant had to stand by helplessly while three of the gang urinated into the tank of her car. Before roaring off they threatened the woman and the attendant with violence if they told the police. Would those liberals have a different attitude to bikies if that woman had been their wife, their mother or their sister? Perhaps some of them would not. "Private citizens are not equipped to enforce the law. They should never have to." Flushed by what amounted to a victory over the police and by the Government's broken promise, the bikies reached a zenith in their rampaging in 1973, attacking shopkeepers, damaging property and harassing families in parks and at camps. Civic leaders were complaining about lack of police action and communities were beginning to form vigilante groups, which was dangerous in itself. Private citizens are not equipped to enforce the law. They should never have to. We had our bikie gangs in Christchurch and I was itching for a chance to get a crack at them. I had dealt with bikies before. As District Commander of the Dunedin police district in the late sixties I had Alexandra in my "beat". I saturated the place with tough cops. I told them to concentrate on drink. Book them if they showed signs of drunkenness; watch for motorbikes in an unsafe mechanical condition. The tactic was to keep at them and force them out of town. It worked then and the trouble at Alexandra started only after I was transferred to Christchurch in 1970. Now I sensed that the gangs were spoiling for a confrontation with the police in Christchurch. That suited me. I was determined to be ready for them and to ensure that the police would win. We received reports that members of the Grim Reapers, Arctic Angels, Epitaph Riders and Outlaws gangs were riding around the upper area of the South Island, disturbing local communities. The Mayor of Picton, C.W. Bryant, complained in the press about lack of police action in Picton where, he said, about thirty members of the Epitaph Riders, a Christchurch gang, were drinking liquor on the footpath and leaving their bikes on a bus stop and in limited parking zones. Headquarters' idea of action was to have the gangs "shadowed" by a posse of mobile police. The idea may have had merit but it became a farce because the bikies behaved themselves only when the police were watching and it was impractical to keep a twenty-four hour vigil. There was also a tendency for some of the immature police and traffic officers to become too friendly with the goons on the bikes. Some police had to be disciplined for actually agreeing to transport some of the bikies' gear in police cars. The gangs moved down the island and reached Christchurch on the night of 30 December. They made their headquarters a house at 71 Kerrs Road, North Linwood, in which two Epitaph Riders rented a flat. Jammed into it were bikies from Auckland, Napier, Hastings, Palmerston North, Wellington and Invercargill as well as from Christchurch. With about 100 people - bikies and their girl friends - drinking together in that space, it seemed inevitable that there would be trouble. I had the house placed under surveillance. "...complaints of the bikies breaking bottles, fighting, urinating in the streets..."
Predictably, we began to receive complaints from neighbours. At eleven o'clock on the morning of Sunday, 31 December, Chief Inspector went to the house and spoke with some of the youths. He made it clear that the police would not tolerate any trouble. Things quietened for a time during the day. But from 8:30 that night we began to receive further calls - complaints of the bikies breaking bottles, fighting, urinating in the streets.... Some of them tied two dogs together. The neighbours were fearful for the safety of their children and some had phoned members of Parliament, including the Prime Minister. I was ready to act. Our surveillance, backed up by the complaints, showed that there had been breaches of the law. I quickly called my senior officers together while eighty-five police and five dogs were being assembled. I decided that the appropriate charge would be "unlawful assembly" under the Crimes Act. That, unhappily, left a legal loophole and it was unfortunate that a new law which would have covered the situation did not come into force until 1st of January - only a few hours away. The first of twenty-five police cars arrived in Kerrs Road at 9:45 p.m. The men were greeted immediately with catcalls and abuse and a shower of bottles and bricks. As more cars began to arrive the bikies retreated into the house, barricaded themselves in and turned off the lights. When any policeman approached, more bottles and bricks came hurtling through the air. With a loud hailer I told them they were under arrest and should surrender. More missiles and abuse were the only answer. I decided that it had become necessary to use tear gas. I was not going to risk serious injury to my men by attempting to storm the house. We fired in two canisters. Some of the bikies started a fire in part of the house and my men put it out with a garden hose before two fire engines arrived.That was the scene as, singly and in groups, their eyes streaming, eighty-one occupants of the flat staggered out on to the street. We had already evacuated the residents of nearby houses and had traffic officers block off the street to the public. Some of the bikies were still ready to fight. There were scuffles in which some of my men were punched and kicked before they had them all handcuffed. "They were like whipped cats, totally demoralised." We sat them in the middle of the road, with the patrol car lights shining on them, as police photographers took pictures. The bikies were a dejected looking bunch. I felt a lot of satisfaction as I watched them sitting there in the rain, some of them still groggy from the whiffs of tear gas, surrounded by policemen and dogs. They were like whipped cats, totally demoralised. A total of seventy-seven bikies and four of their female friends were taken in the raid. They were convicted by a magistrate but, on appeal, were acquitted by the Supreme Court on a technicality. That was unfortunate but I was not too upset. The police had really won. The moral victory came out on the road that night of 31st December. This time the bikies had defied the police and lost. The raid won widespread approval from the New Zealand public. I received literally hundreds of telephone calls, telegrams and letters of thanks. Several members of Parliament were also strong in their praise, including the Minister of Police, Mick Connelly, Roger Drayton, Bert Walker and Bruce Barclay. It had been the first time the New Zealand police had used tear gas other than in certain situations involving armed offenders. I am convinced that the decision to use it was the right one. It was efficient, quick, bringing a fast conclusion to an explosive situation. As a result of escalating violence particularly in bars and pubs, and the streets around them, the then Government had set up the Task Force system. Gideon Tait's predecessor in Auckland, who shared his methodology, initiated the practice of using large military style squads that swept through the more troublesome establishments, making large numbers of arrests. Gideon Tait carried on with and expanded this process, greatly offending the bleeding heart liberals of the time. The Task Force were however hugely popular with the public, one survey of the time showed 98% of the public were happy with the Task Force operations. The graph below shows why - the streets were made safe. This book is no longer available new, but can be found cheaply enough in a number of second hand bookshops (that's where I got it). It's an interesting read, taking into account that Gideon Tait was a product of times past. Some of his ideas on other issues are a bit dated today, but there is no denying his overall effectiveness at controlling violence. Had his methods in this area been consistently applied through to this day, we would not have the problems we do today.